Learning to write has always been my first priority. I saw an old professor last week, and I told him, “you know, I think I finally know how to write a short story.” I started my pursuit of mastering the short story in his class when I was 21. It took me eight years, hundreds of drafts, and now I know I can do it. I’ve always been organized. I’ve been told my first love is writing, but my second is order. I have to agree. When applying for grants, publications, and residencies, I’ve always had organization under control. I’ve always had my self-imposed deadlines, spreadsheets, and monthly goals scribbled on my whiteboard. So, I can write. And I’m organized. Both of those feed into the publicity machine and certainly make drumming up appearances easier. At present, my publicity spreadsheet is in full swing. Every night I’m chipping away at the opportunities on my list, and reaching out to festivals and venues to see if they’re interested in my book. It’s a deeply human book, I think. It’s about lonely people and why they’re lonely. It’s about how much a mother and daughter can love each other and how much that love can hurt. For me, the difficulty in publicity hasn’t been about finding the opportunities or setting the deadlines, It’s been in pitching my work. It’s been in assessing the value I’d bring as a speaker or reader at a particular event or venue, and presenting that value as advantageous to curators and program directors. Publicity work is very different from where I’ve focused my career efforts so far. I learned how to write, how to submit my stories to magazines, and even how to query presses. But I haven’t booked an author tour. This is a first. I haven’t had to think of myself as Christine Ottoni, Author, and sell myself that way. But it’s time I shifted into that Author mindset. I wrote a book, after all. 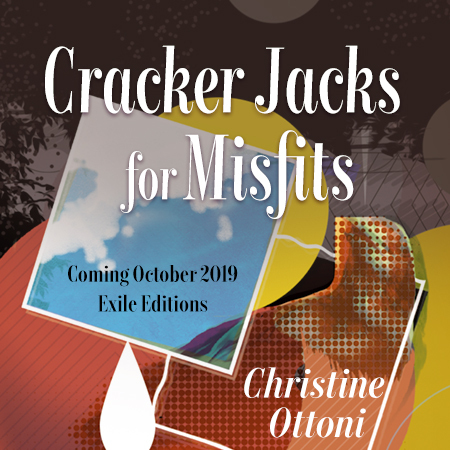 Originally, Cracker Jacks for Misfits was scheduled for release this May, but after conferring with my publisher, we’ve decided to release this fall instead. It was a tough decision but I feel good about it. Spring caught up with me well before I had made a satisfying dent in my publicity plans, and if there’s anything I’ve learned with this whole book promotion experience so far, it’s all about pounding the digital pavement, sending the emails, making the phone calls, and generally putting yourself in uncomfortable positions. And I’m getting better, with practise, at making those uncomfortable moves. Little by little, thinking of myself as the kind of person who could give a large reading and book enough appearances to constitute a tour, doesn’t feel so far off. The sun is, rather reluctantly, starting to come out, and working on the couch at home until seven or eight at night no longer feels like an impossibility. Thanks for reading. More news is on the way and book trailer updates too.